If you are new to all things Australia or just a little bit clueless about the nation’s geography or both (like me), you may not have ever heard of the Murray Darling Basin nor understand even a fraction of its agricultural significance. No worries, me neither. Turns out, the Murray Darling Basin is this inspiringly massive expanse of land that stretches across 14% of the total area of Australia (a country of equal geographical size to the U.S., believe it or not). It is invaluable to the country, housing over 40% of all Australian farms, and producing one third of Australia’s food supply and supporting over one third of Australia’s total gross value of agricultural production of crops like rice, fruits and vegetables (things that I consume basically everyday, living here in Sydney!). Water is absolutely essential for the Basin’s heavy agricultural life and is by far the Basin’s most valuable resource. Did you know that it takes approximately 1550 liters of water to produce just 1kg of paddy rice? Unfortunately, water only comes from a small percentage of the Basin’s vast territory, an amount dramatically lessened due to a devastating drought back in 1995. In the years after that until now, almost all parts of the Basin have suffered reduced crop output and diminished water supply. 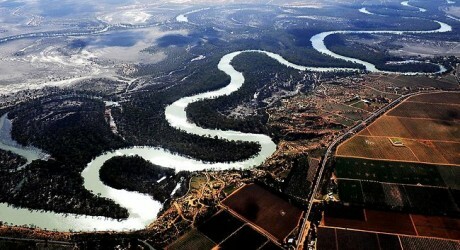 It has moved political parties to work seriously in revising the up-and-coming Murray Darling Basin Plan, which is an important effort to conserve and recover the Basin’s water supply by setting a capstone on how much water can be taken out of it. Why is it that it’s only when we are about to lose something or losing it that we wake up from our apathy to see how important it is to us and how much better we could have treated it? Learning about the Murray Darling Basin is nothing but humbling. It has shown me how selfish and blind I am in my consumption of water, and continues to remind me of our Christian call to be stewards of creation, to be part of God’s effort to restore and reconcile all things to Himself in true shalom. Australians truly put me to shame when it comes to being that good steward. I have been continuously struck by the way Australians consciously think about how they use water. It isn’t carelessly or selfishly. It is a lifestyle and commitment to preserving this dry nation’s limited supply of water by proactively trying to conserve it, such as with the Murray Darling Basin. For me personally, the change must begin with how I even see water. I have no entitlement to it. It is a gift to be cared for, even on the institutional level, and something I respect and will begin to use more carefully in light of the wider Australian—and even global—environmental picture. Thank you for that invaluable lesson, Murray Darling Basin. Aren’t you feeling proud right now, Captain Planet? The disconnection of art and the Church is apparent to many. But one benefit to attending a Christian school of the arts is the opportunity for development outside of class. For the past few weeks, staff and students at the Wesley Institute had been hearing about the coming Retreat Remixed 2012, a chance for Wesley students to be challenged and encouraged by industry professionals and artists. Not only was there opportunity for education in the creative process, but also the possibility for networking and sharing ideas. The payoff, for those in attendance, was great. 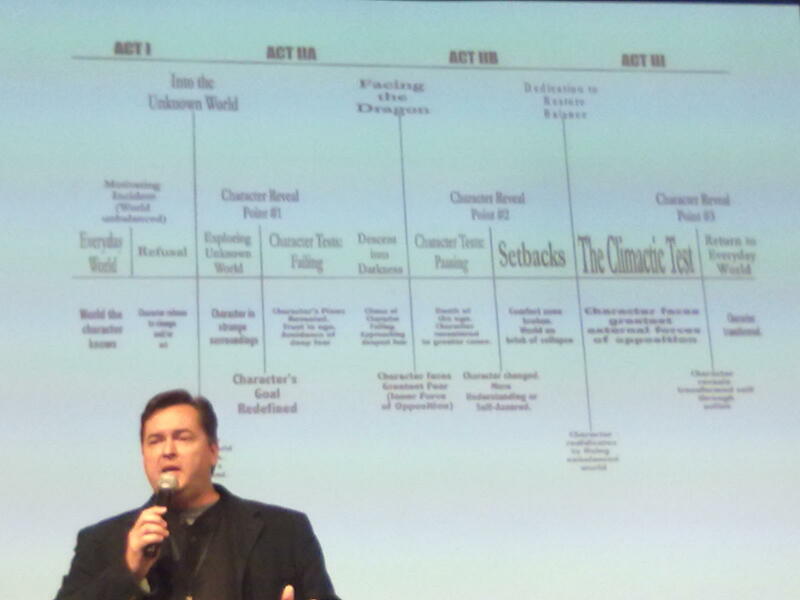 Simon Hunter, New York Film Academy, explains the breakdown of the Hero Cycle. Story is a powerful thing, and it is obvious that this method of relaying information is changing the way the world communicates. Cinema is no longer the only place people go to see a good story. Youtube is full of narratives, ads are mini blockbusters, non-profits create visual parables, and the art of visual story is finding its way into the most unusual of places. Retreat Remixed provided a place to not only dialogue about these trends, but also contemplate how we, as Christians and artists, can hope to interact in the changing world. One speaker put it well when he described that as Christians we should be involved in the kitchen of culture, not the dining room. The weekend involved speakers from several industries speaking on how those arenas were changing and that, in a world of stories; the Gospel is one that needs to be told. Many speakers who had made successful careers in the arts industries told of their passions for storytelling, never ceasing to encourage storytellers to wrestle with questions the world was asking. A continual, resounding theme throughout the weekend was the importance of telling truth in story. If all truth belongs to God, tell it well. Ralph Winter, holder of an impressive IMDB list including the X-Men films and Star Trek instalments, shot straight with the audience telling them, “Dive into the questions people are asking, why would you do antyhing less?” With mind for story as well as marketability, Ralph was an incerdible speaker both encouraging creative expression within the Christian faith as well as pruning bad storytelling habits. “Like a country song played backwards,” he remarked, “‘got my house, got my dog, my family…'” His comment hit home to the reality of many films made my Christians. They simply don’t tell good stories, or they tell good stories in such a way as to make them no longer relevent to an audience in search of substance. Other speakers included Simon Hunter, New York Film Acadmey, who drove home the importance of stepping into uncertainty in order to create. Simon shared a trailer for an upcoming film he directed titled The Custodian. The film was shot on a budget of nearly $0 AUS ($13.75 USD), produced and distributed on inexpensive digital equipment. “I just kept telling people how easy and cheap it was to make films now, even features. So I decided to give it a go myself,” he said. 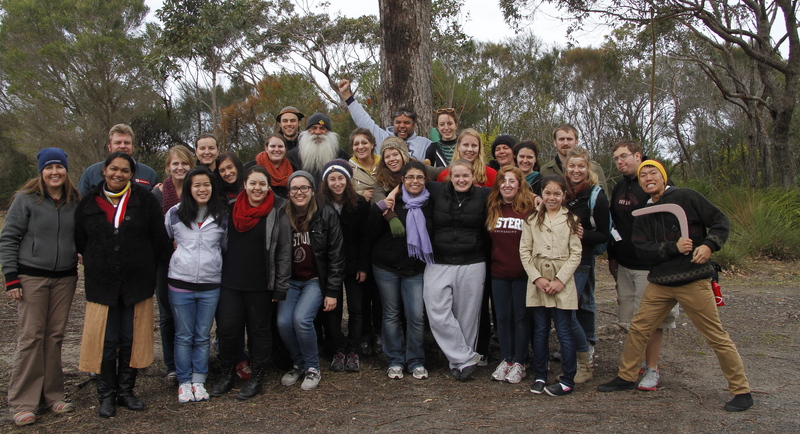 Some of the retreat took place at The Wesley Institute, but for much of it the Wesley students joined the larger SPARC conference in an old stone church in Darlinghurst, east of Sydney. SPARC is an organization of artists passionate about supporting each other and other artists to be the makers of culture on a local and global scale. To be in the same room with hundreds of creative professionals collaborating and celebrating was a rewarding experience. The old stone walls could not contain the energy and excitement about what the possibilities could be for the future. With practical advice, honest challenges and passionate encouragement, no one left unchanged. 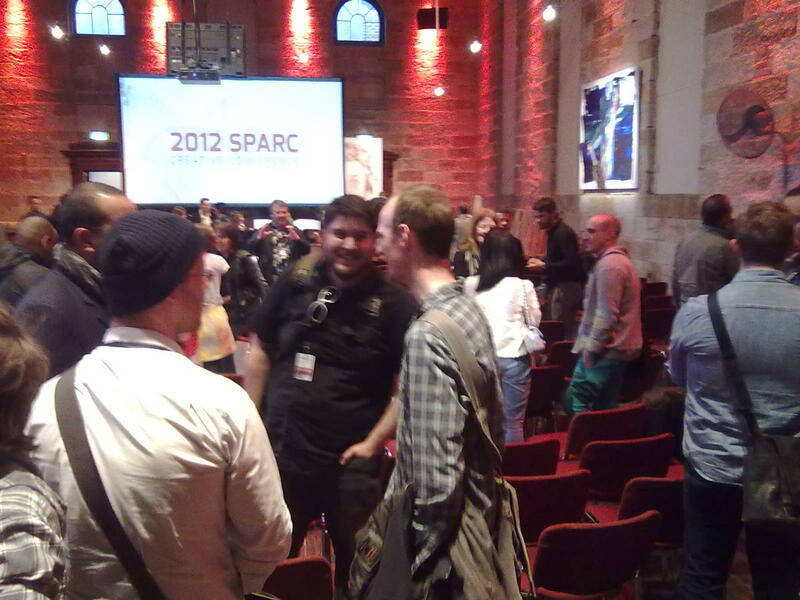 For more photos of the SPARC Conference 2012 follow this link.